We design and develop fully tailored solutions based on the needs of our customers. Several web-based client server solutions have been fully implemented by us and can be found on our Customers and References page. Most of these implementations use digital tags, which increases the efficiency and availability of our customers’ services. The following example is a public transportation game developed with Tag Manager. 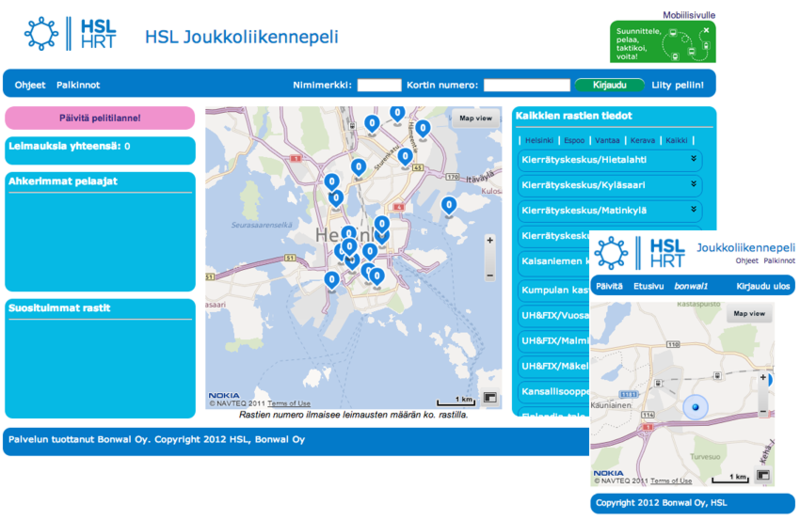 It includes HSL (Helsinki Travel Transport) travel cards, a user interface for desktop and mobiles as well as a tool for the game administrators to read and validate the players’ travel cards. For more information, go to our Customers and References page. Our long-term experience in mobile technologies, applications and concepts forms the base for Bonwal’s competencies. Utilizing NFC technology in mobile applications and smart cards is one of our main expertise areas. If you would like to know, what kinds of possibilities NFC technologies could offer to your business, please contact us and we will be glad to tell you more! We take part actively in various R&D projects together with teams of different organizations. Having knowledge on the process of planning, applying and reporting state-supported projects allows us to help our customers with this particular topic.